KEY CONCEPT: Measuring circumference and understanding of pi. 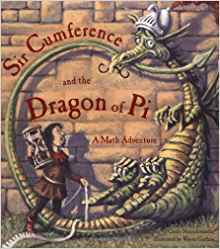 DESCRIPTION FROM THE PUBLISHER: Sir Cumference, Lady Di of Ameter, and Radius are back in their second Math Adventure! This time, a potion has changed Sir Cumference into a fire-breathing dragon. Can Radius change him back? Join Radius on his quest through the castle to solve a riddle that will reveal the cure. It lies in discovering the magic number that is the same for all circles.